Tamayo: The New York Years delves into Rufino Tamayo’s experiences and perceptions of New York City in the 1920s and 1940s, examining both the works produced during his time there and its larger influence on his artistic practice. Engagingly written and richly illustrated, this exhibition catalogue is a prime example of what this genre of publication can offer readers—a sophisticated analysis of a key period in Tamayo’s career that is informative for scholars while remaining accessible and interesting to students and general audiences. E. Carmen Ramos’s extensive essay builds on previous surveys of Tamayo’s career by focusing on the artist’s two stays in New York City, which, although long recognized as important to his professional trajectory, have never received such in-depth study.1 In addition to her essay’s captivating illustrations, Ramos weaves the catalogue plates into her narrative. Her careful visual analysis of these works reinforces her exploration of Tamayo’s time in New York City, sometimes emphasizing her assertions or acting as prompts for the larger thematic questions that animate Tamayo’s paintings. In the first section of Ramos’s essay, “Beginnings,” the author discusses Tamayo’s early life and career, pressing on a key issue for understanding Tamayo—the ways in which he was both a part of the modern Mexican art movement that flourished following the end of the Mexican Revolution in 1920, and how his beliefs about the role of art sharply set him apart from his peers. In the course of his time at the Escuela Nacional de Bellas Artes, between 1917 and 1920, and his later work as an instructor of the Best Maugard drawing method, Tamayo came to question the contradictions that were inherent in the state-sponsored Mexican art world. Many of the post-revolutionary cultural programs framed their missions in terms of establishing Mexican identity, or mexicanidad, which in turn derived from contemporary ideas about Mexico’s indigenous past and present. As Ramos astutely explains, Tamayo, who at times embraced his Zapotec ancestry, had an evolving relationship with these ideas. His early utilization of Pre-Columbian motifs in his work evoke indigenismo, even as his interest in European painting styles and modern industrial subjects reflect an artist who was as interested in looking to international trends for his work as he was to Mexican history. The next section, “New York, New York,” explores Tamayo’s first extended trip to that city, from September 1926 to December 1928. Tamayo soon found himself part of a large community of Mexican cultural figures living in New York City, such as composer Carlos Chávez, poet and art critic José Juan Tablada, and artist Miguel Covarrubias. This extensive network of colleagues offered a gateway into the New York art world, and Ramos argues convincingly that Tamayo’s exposure to the city’s cultural institutions had a transformative effect on his artistic practice and his professional career. They offered an opportunity for him to see European Old Masters as well as contemporary works that represented the latest trends in European and American modern art. As Ramos points out, it seems clear that Tamayo’s encounters with this material shifted his perspective on the role of art and its making, taking him further away from the ideologically driven work of many of his contemporaries in Mexico. His exposure to the modernist still lifes of Georges Braque and Henri Matisse, and the dream-like landscapes of Giorgio de Chirico, would help inspire him to explore more internal and personal subject matter in his own painting. At the same time, Tamayo began to develop a visual language that drew on American and European work, as well as his knowledge of Mexican art. As he would later state, and which Ramos drives home, it was in New York City that he acquired a sense of “universal” art that was accessible to all audiences (18). In “Leader of a New School of Mexican Painting,” Ramos follows Tamayo from New York back to Mexico City, where he spent the next eight years. Although it is in a sense a departure from the main theme of the catalogue, this section is among the most fascinating, demonstrating how the artist’s first sojourn in New York City had a dramatic effect on his work and helped position him in the Mexican art world. As Ramos points out, it was during this time that Tamayo began to formulate his own “alternative vision of mexicanidad” (29). Tamayo’s work from this period utilizes a visual language that blends images and motifs drawn from Pre-Columbian and Mexican popular arts with European traditions, recalling works by Paul Cézanne and de Chirico. This synthetic approach to painting aligned Tamayo with the Contempóraneos, a network of writers, poets, and visual artists that remained skeptical of the collectivist and politicized approach to art making then championed by many in the Mexican cultural world. Even though in this section Ramos examines Tamayo’s work in Mexico rather than New York, her arguments here reinforce the importance of this period in Tamayo’s career. Much as his time in New York City in the late 1920s shaped the work he would then produce in Mexico, these years in his native home primed him for his lengthy return to New York City. The final two sections, “Return to New York” and “Tamayo, Picasso, and Midcentury American Art,” examine the artist’s return to the United States in 1936, where he would remain until 1948. As during his previous visit, he immersed himself in the New York cultural world, working to perfect the nonnarrative approach to painting he had begun to develop during his time in Mexico. Some of the first works he produced in New York City depict scenes drawn from its urban environments. As Ramos points out, these were met with mixed success; many critics questioned the lack of “Mexicanness” in the works. Ramos touches upon some of the other Mexican artists who had been working in the United States in the years preceding Tamayo’s arrival, including José Clemente Orozco and Diego Rivera, who contributed to what has become known as the “vogue” for Mexico in the United States in the 1930s. Although she offers some comparisons, it would have been interesting to delve further into the contrasting experiences of these artists during their time in the United States. Unlike Rivera especially, Tamayo seems to have eschewed the role of visiting foreign artist as celebrity in favor of integrating himself into the New York arts community, evident in his gallery associations and his teaching position at the Dalton School in Manhattan. Ramos explores the profound effect of Pablo Picasso’s painting on Tamayo’s work, especially Guernica (1937; Museo Reina Sofia, Madrid, Spain), which he would have seen at the Valentine Gallery (then representing Tamayo) in 1939. Beyond the formal similarities in the works of the two artists, Ramos’s arguments regarding Tamayo embracing large-scale painting are particularly interesting. Although he completed two murals in Mexico in 1933 and 1938, Guernica appears to have awakened for Tamayo the possibilities of adapting his own nonnarrative language to mural-scale works.2 His mural Nature and the Artist: The Work of Art and the Observer (1943), for the Art Library at Smith College, as well as his later mural-scale sand on canvas painting America (1955), for the Bank of the Southwest in Houston, show how Tamayo reimagined the possibilities of this genre of painting—ironically offering his own interpretation of the Renaissance fresco, just as Rivera had done several decades earlier. Completed toward the end of his time in New York City, these large commissions were among the works that would make Tamayo a well-known figure to collectors and museums and permanently establish his reputation in the United States. Ultimately, Ramos’s reassertion of Tamayo’s connection both to New York and to a larger international network of modern art is among the greatest contributions of this book. In doing so, she further confirms Tamayo’s status as one of the leading modern artists of the twentieth century. Written with clear and accessible prose, this exhibition catalogue is both informative and a pleasure to read. It is beautifully designed and rich in color illustrations of Tamayo’s works, including many that come from private collections and are less well known. It is a valuable addition for scholars working in modern Mexican art, of course, but also for those interested in the emerging discipline of Pan-American modernism. 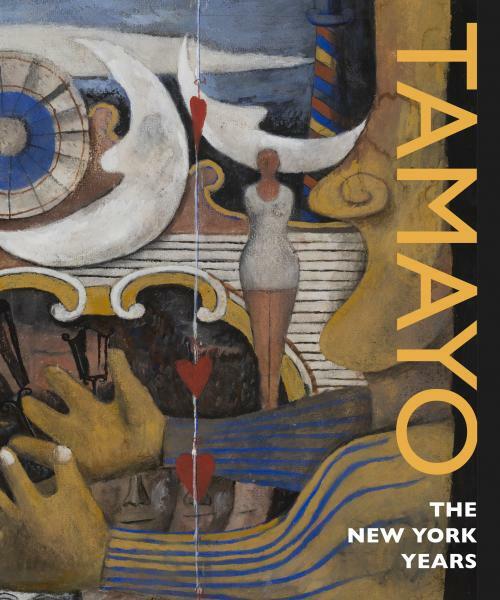 Cite this article: Mark A. Castro, review of Tamayo: The New York Years, by E. Carmen Ramos, Panorama: Journal of the Association of Historians of American Art 4, no. 2 (Fall 2018), https://doi.org/10.24926/24716839.1672.